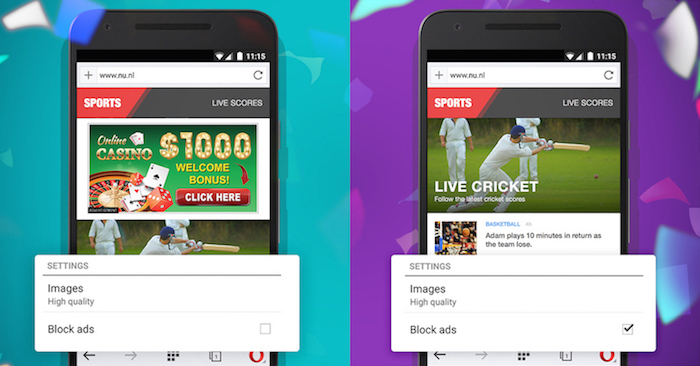 Opera has integrated ad blocking mechanism into its mobile browsers and desktop ones as well starting with the Opera Mini. The Opera Mini is mainly designed for those with slow internet connections as the browser houses a data compression technology allowing it to serve content in the web much faster. This consumes less bandwidth when compared to Chrome or Opera. By integrating ad blocker in the new browser, Opera Mini for Android will definitely be loading pages much more faster. According to Opera, with the ad blocking mode, speeds have increased by 40%. But if you are using any other browsers, it would require plugins or root access to the mobile for the ad blokcing to take place. How to do it? Users would need to opt in to first on the first run of the Opera Mini and will be ready to go. The same exact feature will also come to the desktop version but no details when. Ad-blocking is one of the most difficult conundrums for all as at one hand users are actually bombarded with ads every minute they browse a page. On the other hand, content creators needs to sell ad spaces so that they can produce free content for users and get some money for the ads they sell in order to stay in the business.